UCL patch, which is very different from the current ones. You can see Xabi Alonso, Nihat Kahveci or Valeri Karpin in there. -The club name means Royal Society of Football in Spanish. 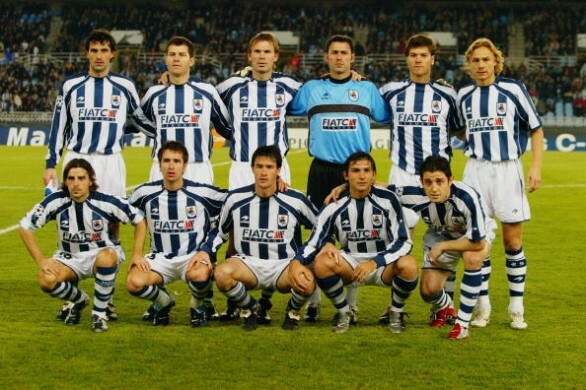 The club is nicknamed in Basque as Erreala or the txuri-urdin ("white-blue" due to the colours of their kit). The colours stem from the flag of San Sebastian: a blue canton on a white field. Wow, is like more than two months since I posted my last shirt... this is a bit akward. I've just haven't found the moment to post during this time, but finally I have some free time, so I'll show the shirts I've purchased. Gabriel, a German collector, contacted me to tell me about the shirts he was selling. I fell in love with this one, we came to terms and I bought it for 40€. And as you can see, it's a really rare shirt. I'll try to find an official name and number to print on it.